Challenge: Show a group of leaders or champions of your armies. Your scene should be between 2-5 minifigs on a small simple landscape. The minifigs should represent either the Leaders of your army or it's most elite champions. Emphasis should be on creative minifig combinations and a short backstory for your commander(s)/champion(s). Challenge: Show a group of your most elite warriors. These guys are the best of the best and are the professional warriors. Depict a scene of approximately 8-30 elite warriors. 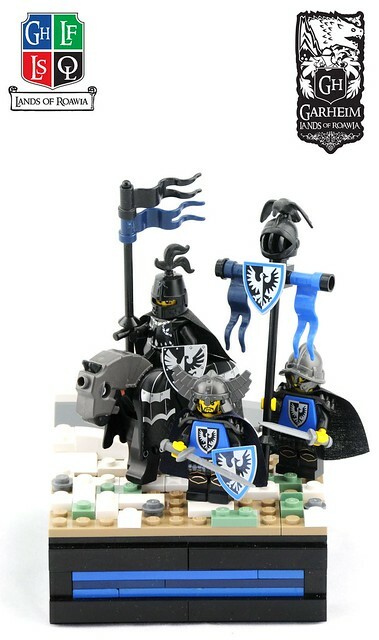 Emphasis again should be on creative minifigs, but also there should be a theme tying them together and relating to an awesome backstory you create for them. eg. A company of heavy Loreesi horse, or Lenfel Rangers, Garheim Huscarls and Outlaw scum warriors. Don't be restricted by the stereotypes though, maybe you have a company of heavy Lenfel Horse, Loreesi light infantry, Garheim elvan rangers, Outlaw noble knights??? Again don't forget to present them on a nice but simple base, small structures or trees may be used aid in presentation but the focus should be the figs. Size: Unrestricted greater than 32x32 in foot print. No maximum size. Challenge: Are we a community of castle builders or what??? Show us your best castle. No holes barred, complete awesomeness, go nuts! Of course the castle should clearly show it's allegiance to your faction using banners, shields and colour scheme. Don't forget the CCC should be coming up soon, so you may even be able to duel hat this one! (If you do be sure to comply with their rules - I believe you need to post your entry over on Classic Castle before posting anywhere else). Something of a twist for this global challenge.... Each builder may submit one entry from any of the above categories for a different faction. So basically you submit a 4th entry, from any of the above 3 categories, but the subject of your entry should be either figs or a castle from a faction that you don't belong to. For example: I am clearly a Lenfel (why would you be anything else???) but for my wild card entry I may build a restricted Loreesi entry... Always secretly wanted to be from another faction? Here's your chance to try out something completely different from normal... what's stopping you!?! - Each builder may enter each of the above categories once for a maximum total of four entries. 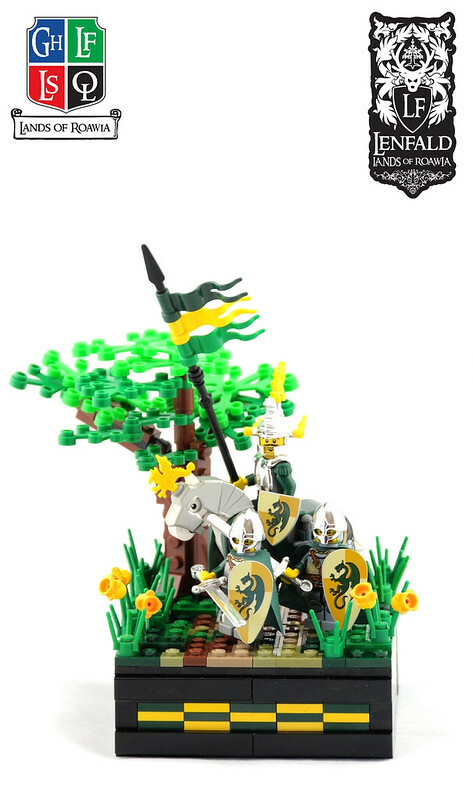 - Each build MUST contain the LoR digital banner (if you are having issues PM me and I will help/add it for you) and your faction banner in either digital or Lego/or both. - Winners for the first 3 categories will be determined the usual way - faction vote followed by open vote. - Winners for the wildcard category will be determined by open vote. For example, if there are a total of 10 entries, all will compete against each other, even if they are from the same faction. Deadline: Midnight, Sunday 18 December (any time zone). -Personal Points. Participation: 2 for Bignette, 3 for restricted and 5 for unrestricted. -Winners in each category an additional 5 points, 10 for unrestricted. We all need to get involved in this one everybody! Really get our brand out there and encourage new people to join up and breath some new life into the game! To that end I offer the following: Further to the faction and personal points, If we get enough entries, (20 plus) I will donate a yet-to-be determined new set/s or parts pack for a build/s to be decided by the KC. I will post a picture of the prizes here within a week for your motivation.... open to suggestions, remembering we don't get the selection here in sunny Canberra that you guys in the big cities of the States get. Of course if you win, minors should seek parental permission before sending me your postal address. Questions, queries, comments or doubtful points, post below Enjoy! While many regions of Roawia have legends of a Black Knight, one of the most famous is that of the Black Knight of Skraborg, in Garheim. The Black Knight of course conceals his identify, as most Black Knights do, but he and his retinue will always turn up as the champion of Skraborg. Whether to fight in battle, defend the people or represent the city in single combat, the Black Knight of Skraborg is renowned for his superior skill and prowess in all forms of combat. Roaming the barren deserts of Loreos is a warrior known only as 'The Desert Scorpion'. 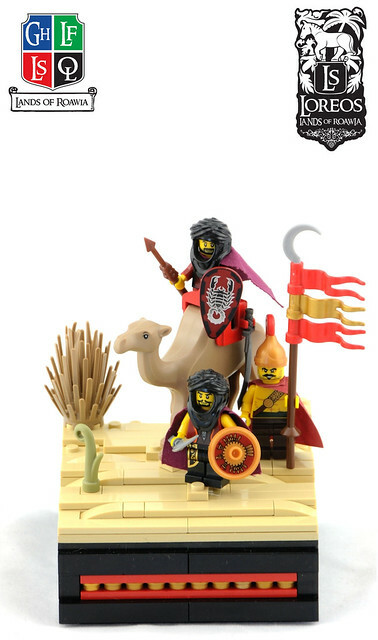 Together with his small retinue, he is said to show up whenever a help is required in the desert, and is know to appear alongside Loreesi forces in battle. Legend has it that his javelins are dipped in scorpion venom, and even a scratch can kill! I should be able to participate with a two part stand off between Sir Caelan's forces vs his rival across the Aines River, since I can also build for the Loreesi this time under the Wildcard option, very cool idea! Honestly, this GC is almost as generic as all the rest, and I was really hoping for something less so, so I'm slightly disappointed. But, it's good enough to perhaps win a couple duel entries from me. I do hope the next GC will actually have something to do with the storyline, and be different then usual in the topic and all, that's what I really need to get me back into this I think. Really interesting GC! I stalked for awhile and missed the last GC with a full-fledged castle involved. I'll have to give this a good shot. A Bignette I should be able to get in for Lenfald and for my fourth category. A restricted will be hard due to I don't currently have an actual army for my Lenfel. I'll just have to wait and see. But thanks for setting up this GC! While I think most of us were expecting something to do with the story I mean it's not completed yet and may take awhile to. And having this as something to build for while waiting will be fun! Yeah, that makes sense, but I must say, with all the cool contests around a lot of builders are not around needing some 'fun' reason to build . Nevertheless, I'll try to make something for this . The storyline at this point is very difficult to launch a challenge around, and it will be similar for the next couple of instalments (FYI construction has already started on quite a few of the next updates). I mean, what would a challenge centred around the current update look like?? No one else knows what the explorers found and the fate of the two??? survivors is unknown. So kind of difficult to base a challenge around! Instead we tried for a more 'generic' challenge, although if you look closely you'll see that while the subject matter may be somewhat generic, we've changed the format alot. Firstly the size categories, while the same, each now have their own theme. The first two are minifig related for a reason. Easy to build and put together, yet still lots of fun, we hoped to get people involved who may not have the time for huge creations. Then the unrestricted is basically there for larger builders to go nuts, I mean we haven't had a proper castle building contest for sometime.... Then we get to the wildcard. It's something we have never tried before and is a direct answer to the discussion in the suggestions thread about mixing up factions a bit. The first attempt at this, Outlaw October, hasn't been very successful, so hopefully this will be more so. I know that I am excited to be building for another faction! Anyway that is the thinking behind the way this challenge is set up. Sorry if you guys were expecting something directly related to the story update (although factions with impressive armies/castles may have some advantages in the story to come - hint-hint) but as explained, a directly related challenge is probably not possible for the next few updates. As always feel free to continue making suggestions and comments and we'll continue to try and give everyone the game they want! Can't wait to see how it ties in so far... Sounds good. Also, this challenge sounds like a great intro to the new storyline. Bignette Entry Edit: Another example for you as I have switched factions! Sir Roland the Magnificent, Baron of Edelberg, Champion of Isil Oro and Commander of High Duke Alfred's Personal Guard. Much is said about Sir Roland, renowned swordsmen, expert horseman, veteran commander, he is the champion of the city of Isil Oro in every way. Seen here outside the city, distinctive in his flashy silver armour and flanked by two of the cities elite huscarls. 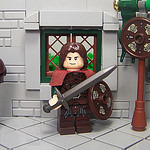 Sir Roland is every ready to defend both his city and the great faction of Lenfald from all enemies. Wait, so is the bignette 16x16 max? Is a smaller footprint allowed and/or are irregular bases allowed? Yes and yes. 16x16 with limited overhang is the max. Smaller is allowed. Somewhat irregular is allowed, but should be similar in size to the 16x16, within reason (ie, no 1x256 stud builds allowed). King's Council reserves right to DQ an entry if it is deemed too far out of compliance, so it's best to check with your FO if you think you're pushing the envelope.